From the biblical creation story in which it is a snake which leads to Adam and Eve’s expulsion from the Garden of Eden to our modern fascination with dinosaurs there is something peculiarly intriguing to us about the idea of the reptile. It strikes some deep chords in the human psyche and seems to almost embody for us the idea of “otherness”. Small wonder then that reptilian beings frequently crop up in the accounts of human encounters with aliens. Unlike other aliens, however, who are usually portrayed as either benevolent or clinically detached, and frequently exhibit a concern for human welfare by issuing warnings about future catastrophes, reptilians are almost always seen as sinister and hostile. They frequently feature in the most brutal alien abduction stories. 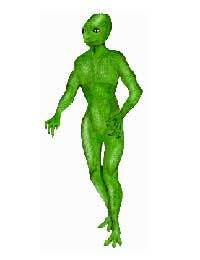 The classic reptilian alien described by those involved in close encounters is generally humanoid in appearance, standing six or seven feet tall, with scaly green skin and black or yellow eyes. Some even argue that the reptilians may not be extra-terrestrial at all. According to this view, the reptilians may have evolved on Earth and later migrated into space or they may still be living here as a community, inside the Earth rather than upon it. These authors point to the researches of Dale Russell, a distinguished palaeontologist, as evidence that they may be on the right track. Russell once carried out a thought experiment, speculating about what dinosaurs might have turned into had they continued to evolve, rather than being wiped out. The result was a bipedal humanoid reptile, looking very much like the kind of creature describe by modern UFO contactees. Reptilians are also the subject of what is probably the most far-reaching conspiracy theory within UFO lore. Some believe that they have the capacity to shapeshift into human form, allowing them to infiltrate our society. David Icke believes that, from time immemorial, reptilian shape shifters have entrenched themselves in positions of power within human cultures. According to him, many of the most powerful people in the world today, including politicians, royalty, celebrities and business leaders are, in fact, reptilian aliens pretending to be human. On the list of reptiles are: Tony Blair, the Bush political dynasty, and the royal family, among many others. According to Icke, there are a number of key reptilian bloodlines and, as a result, many of these powerful people are related to one another. Icke believes that these reptilians drink blood and perform human sacrifices in secret.He claims to have spoken to many people who have witnessed this shape-shifting take place. A woman who claims to have been a friend of the late Princess Diana also told Icke that Diana had once confided in her that she believed the Windsors were not human. If the reptilians are infiltrating our society and gaining control of all the levers of power, what is their ultimate goal? According to the reptilian researchers, the lizards plan at some point to take control of human society overtly, introducing open dictatorship, and subjecting mankind to eternal slavery. Theories about reptilians are among the most fantastic in the UFO literature. They can be either very funny or very alarming depending on how seriously you take them. I hadn't heard of David Icke (sp?) shape shifters or reptilians back in 1989. And I would have happily forgotten the bizarre incident I saw one evening on my way home from work, had my coworker not been standing right next to me when it happened and witnessing the very same thing I did. A man we were speaking with in the lobby of an LDS ward building in Tempe, Arizona- turned into a lizard and back into a man again right before our eyes. The whole thing couldn't have lasted more than a minute but it seemed longer because it scared the hell out of me. I'd never seen or heard of anything like it, neither of us had. The people that walked past us didn't appear to notice what was going on. And I wondered to myself if the man knew I could see him this way (lizard-y) and immediately after I'd thought that, I was even more frightened wondering if her could read my mind. I did not want him to know that I could see what was going on. Somehow my friend from work and I managed to stand there calming until we were don't speaking with the guy. As we neared the double door exit, my friend started to ask 'did you...; but I cut her off tersely. I said hang on a second, like everything was cool. But once we got in the car and drove out of the parking lot at lightning speed, we freaked out! We compared notes but comparing nonsensical notes doesn't help make sense of things. That was by FAR the strangest thing that has ever happened to me. I've seen a few other mildly unusual things but nothing comes close to being absolutely bizarre like that. I bet I haven't told 3 people about what I saw that night in the 25+ years since it happened. I'm okay if people thinkg I'm a little off but not that far off- that's butterfly net time, although it really isn't I guess. I know what I saw and I have a witness.